used by the priest for the Precious Blood. 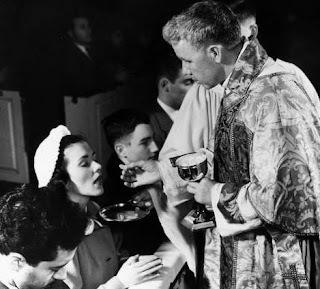 The chalice does not have to be jeweled, or wrought with exquisite artistry, but if it is a styrofoam cup, even a pastel colored, religious picture or symbol styrene, not only does the Church prohibit this usage, we instinctively know this is wrong. So if I am making any sense here, do it not appear that our post VCII liturgies have all too much styrofoam in their make-up? Yes, I think that you have recognized what we are getting at. The whole liturgy is supposed to glorify God. The infinite glory rendered to God in the representation of Christ's sacrifice on Calvary is clearly the most important aspect of the Mass, but this does not allow us to regard as inconsequential the small, finite glory that we can give to God by giving him only the best of everything: our best selves, dressed in our "Sunday best", our best music, art, architecture, etc. Only the "accidentals" changed after Vatican II, indeed, the essence of the Mass is unchangable, but "accidental" does not mean "unimportant". Just found this site and this old thread. As a convert from non-practicing Protestantism of birth/childhood to government school instilled state worshipping agnostic leftist back to an amorphous cafeteria Protestantism after I had children I am strongly Trad. In RCIA the tone was apologetic of the "ritual" of the Church, the Mass downplayed, the emphasis on all Christian demoniations being brethren and ecumenism. I had never attended a Mass but after reading Chesterton, Belloc, (ironically) C.S. Lewis, and a few instances of personal divine revelation I came to understand the Church and that that was where I belonged. Unfortunately, the Church of Chestertons day, and even Lewis' day no longer existed. The "trappings", "smells and bells" that I was eager for were gone, replaced by a Protestantized and sheepish Faith, American flags everywhere, and infantile collectivist "hymns". "Confession" is now "Reconciliation" and is nearly nonexistent due to inaccessibility (one hr a week before Mass in a glass walled office behind the pews). I have come to believe that a lot of the clergy have lost their faith by the way they treat the sacraments and the Mass...or perhaps they no longer think these things are a big deal since we have armies of lay people who are doing what was reserved for clergy not that long ago. I have no desire to lector or serve communion. My vocation of marriage and parenthood is difficult enough to handle. I would love to attend an FSSP church instead of being made to feel like a troublemaker or "divisive" (as Mark Shea complains about the attacks on "unity" by "Trads"...how dare they attack the "unity"? )for longing for the beauty and riches of the Faith. I realize it's been a while single this post was published, but I thought I might share a few thoughts. I'm an an Anglican in the process of becoming (Roman) Catholic, and I'm actually finding myself on the trad-ish side of things. I went to a Catholic high school, and for masses and prayer services held in the auditorium, the music was always right out of Spirit & Song (1 or 2!) and generally were retrospectively kind of cheesy. However, the Anglican parish at which I'll no longer be worshiping primarily actually maintains a very high liturgy, particularly in regards to the music. It's all hymns, organ interludes, and classical choral arrangements, and the music (along with some other factors) keeps the atmosphere appropriately reverent. In trying to introduce evangelical friends to the more orthodox Christian traditions, I'd actually rather take them to this Anglican parish than to one of the Catholic parishes in the area, in part because the liturgy is higher and more reverent. I understand that some parishes don't have the resources for a marvelous sanctuary choir, but putting together reverent music shouldn't be that difficult. It only takes one person who has a decent voice and can read music to cantor a chant setting. 4-part hymns also aren't generally that hard, though I understand many parishes have trouble finding good organists. I'd actually find it interesting to see music from the Taize tradition utilized in the mass- it's reverent and generally pretty simple.